The mausoleum of Khoja Ahmed Yasawi is an Islamic religious monument built in the Timurid architectural style. Khodja Ahmed Yasawi is the most prominent religious figure in the history of Sufism (a mystic movement in Islam). He also was a poet and philosopher. He died in 1166 or 1167 (some sources say 1146), and was buried in a small mausoleum attracting many pilgrims. 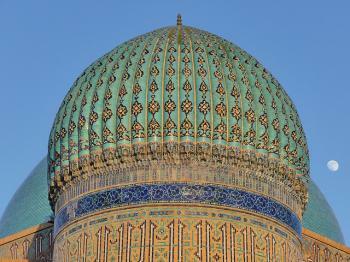 It was Timur who erected the immense mausoleum over the burial vault of Ahmed Yasawi in the 14th century. In fact, the "Mausoleum" is more like a multi-functional building: a meeting hall, a mosque, an archive and with rooms for the serving staff. It's situated in the town of Turkestan. 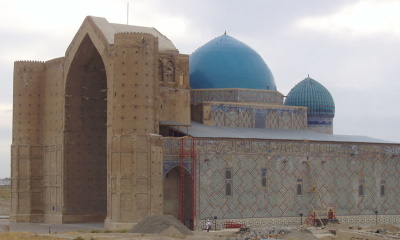 After the death of Timur in 1405, the buildings remained unfinished. I visited this WHS in June 2017. This site is the main reason I included Kazakhstan on my Uzbekistan-Turkmenistan trip and I'm glad I spent 2 nights in Turkestan as the mausoleum didn't disappoint. Even after having visited Uzbekistan's Timurid monuments, this mausoleum still ranks as one of the most grandiose and best-preserved in the region. The mausoleum alone can be visited in less than an hour but it would be a great pity not to revisit at different times of the day (if you're lucky enough to visit on a sunny day) to view the intricate geometric designs and turquoise and blue tiles with the best light conditions. Moreover, most of the pilgrims visit just after sunrise or just before sunset and go round the main building touching the walls and stopping every now and then to pray. Even though entrance to the mausoleum and all the other buildings is from 9am till 6pm, the whole complex exterior can be visited freely at any time of the day. The fact that it is still an active pilgrimage site adds to the whole experience in my opinion. In the morning the best lighting is on the reconstructed fortification walls and main entrance gate, while in the later afternoon, the best lighting is on the rear part of the mausoleum and its domes. There are UNESCO signs all over the place even in front of buildings which have nothing to do with the inscription. However, there is a simple makeshift sign in front of the mausoleum's entrance depicting the mausoleum's inscription on the WH list. Visiting the other buildings is worthwhile if you have the time. Lighting at night is very weak and almost non-existent. Close to the Turkish Mosque, some camels are kept and actually still graze in the 'mausoleum complex'. The modern mosque has glass walls and the Khoja Ahmed Mausoleum can be seen from its inside at all times. The local museum is also worth visiting even though it doesn't offer much in terms of added value. Another important aspect worth mentioning is that the Koranic script and motifs present in the geometric tiles has not been totally erased during restoration during Soviet times (unlike what has happened in other Uzbek Timurid monuments) even though there still were some mistakes. At least some original script is present. The only WHS I haven't visited (yet) in Kazakhstan is Tamgaly but judging on what I read about the site, I think I can safely say that the Khoja Ahmed Yasawi Mausoleum is hands down Kazakhstan's best WHS and one of the top WHS on the list. Beyond the value of the building itself there were 2 aspects of our visit to the Mausoleum of Khoja Ahmed Yasawi in May 2017 which we found of interest – first, the extra insight and impetus it gave us for understanding the developing place of religion in contemporary Kazakhstan (a theme we followed throughout our tour of the country) and second, the way in which the UNESCO site had been defined and presented. First the building itself and the logistics. The Mausoleum dominates the town of Turkistan - we drove up from Shymkent in the morning, stopping off at the T List site of Otrar and the Arystan Bab Mausoleum (another nearby pilgrimage site) for an hour or so on the way, had lunch in Turkistan, gave the mausoleum and the surrounding area a bit over 2 hours and then drove on to Aksu-Zhabagly, by-passing Shymkent on the way back by following the main highway. 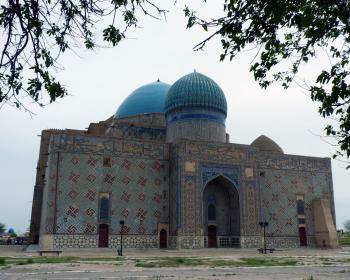 The mausoleum is set in the centre of what was once the old city of Turkistan and is the only extant original structure from the city’s pre-Russian era. Various buildings nearby and a part of the walls have however been recently reconstructed but, around the Mausoleum and within the boundaries of the old city, lies a vast archaeological zone of decaying mud walls of ruined buildings and abandoned “digs”. The nearby museum was once a barracks and was constructed by the Russians from bricks ransacked from another of the tombs inside the perimeter. The city has a history dating back to the 4th C and became a trade and religious centre. In the 12th C the poet and mystic “Kawaja” (Or “Koja” - an honorific meaning “master”) Ahmed Yasawi (1093-1166) lived there and founded a Sufi order which bears his name. In 1389 Timur ordered the construction of a new Mausoleum for him to replace an earlier one but, on his own death in 1405, it was still incomplete. As Wiki states, “Despite its incomplete state, the mausoleum has survived as one of the best-preserved of all Timurid constructions”. ICOMOS also describes it as having been better preserved than many other Timurid monuments such as the far more famous Timurid structure of Bibi Khanum shrine in Samarkand. In my main reference book on the subject (Islam Art and Architecture ISBN 3-8290-2558-0) a large picture of the Mausoleum introduces the chapter on Timurid architecture. The building is undoubtedly of “World” architectural significance despite its somewhat isolated location away from more famous Islamic buildings! A visit will consist of a circuit (or circuits) of the exterior to see the tiled decoration on 3 of its walls and the 2 domes, followed by entry into the mausoleum from the unfinished side (no tiles). We had a local guide with excellent English from a team of smartly uniformed ladies dressed rather like Emirates cabin crew with tailored dark blue trousers, light blue “modern” head scarf and yellow jacket! Inside is a mixture of “museum” and “holy place” of which more later. After taking several interior photographs we were told that we shouldn’t do so – but no one really seemed to mind. The building is far more than “Mausoleum” and contains a series of rooms on 2 floors around a large hall under an enormous main dome with the great man’s tomb offset below the second, smaller and ribbed one. The main interior is plain white with only stalactite “Muqanas” for decoration. The side rooms functioned as library, kitchen, meeting rooms, mosque, lodgings. The Central Hall (or “Khanqa” ) itself was for Sufi ritual gatherings. Various books call these Sufis “Dervishes” but, as far as I was able to discover from our guide and from later research, this is a generic term and the “Whirling” which is often associated with the word was and is not a practice of the Yasawiyya school or even present in C Asian Sufism. The various rooms are set up as museums with, e.g the kitchens, containing huge ovens and troughs to show how food was produced and carried to large numbers of pilgrims. A coin collection was somewhat less interesting and the library was empty. The most impressive “article” in the building is the enormous (2 tonne) and highly decorated bronze “Taykazan Cauldron” donated by Timur to the mausoleum and now sitting dead centre in the Khanqa. This resided in the Hall of Turkic Culture in the Hermitage from 1935-1989 when it was returned. Apparently the Bolsheviks had to build a railway “spur” to take it away! There also used to be 6 bronze lamps presented by Timur. Much to Kazakhstan’s chagrin, 2 still remain in the Hermitage and one somehow found its way to the Louvre! Entrance to the tomb room is now closed – to preserve it and the very fine carved doors we were told. In a little side room a grilled window allows the tomb to be seen and, when we were there, a few pilgrims sat, prayed and donated etc. In early Communist times the building was entirely closed and was later opened strictly as a museum and, as far as we could discover, it is still the case that no form of larger/grander religious rituals take place inside main hall. On the other hand we were told that Turkistan was traditionally regarded as the “Second Mecca” (we were told the same about Osh also!!) and that 3 pilgrimages there equalled a Hajj. So, where were all the pilgrims? Maybe it was a quiet day - but Kazakhstan is very much in the process of developing an acceptable way of incorporating “religion” into its culture after years of hostile and atheistic Soviet policies and the Yassawi Mausoleum is inevitably a part of this. Islam in this area was always somewhat mixed with shamanistic aspects and the peoples of the Steppes adopted it in different ways from those of the settled agricultural regions of Uzbekistan etc. Independence and the relaxation of Soviet anti religious policies mean that Kazakhstan is having to develop a national consciousness and a religious “settlement” within which some form of Islam must be a significant part. But what form? Nazarbaev is trying hard to direct people into non-extreme forms of both Christianity and Islam and to emphasise the Kazakh aspects of the latter in order to stifle the introduction of hardline views from the south and Arabia. As an indication of how “naïve” the people are in these matters, the massive new Hasrat Sultan Mosque in Astana (opened 1992) even has notice boards outside and inside telling people how to pray, wash, enter/exit and dress! The Norman Foster designed “Palace of Peace and Reconciliation” in Astana is another manifestation of Nazarabaev’s approach – “constructed to host the Congress of Leaders of World and Traditional Religions. It contains accommodations for different religions: Judaism, Islam, Christianity, Buddhism, Hinduism, Daoism and other faiths…. (it) expresses the spirit of Kazakhstan, where cultures, traditions and representatives of various nationalities coexist in peace, harmony and accord” (Wiki) . I found this article to be quite a good introduction to the complexity of Islam in Kazakhstan and the nature and role of pilgrimage - "Traditional Kazakh culture and Islam" . Yassawi is acceptable as a Kazakh national and Muslim hero and this is more important in Kazakhstan than the exact form of Sufism he developed. And his international importance is somewhat limited too – he is described in his Wiki section as a “poet and Sufi, an early mystic who exerted a powerful influence on the development of Sufi orders throughout the Turkic speaking World. Yasavi is currently the earliest known Turkic poet who composed poetry in Middle Turkic…. (He) was a pioneer of popular mysticism, founded the first Turkic Sufi order, the Yasawiyya or Yeseviye, which very quickly spread over Turkic-speaking areas”. If however you have a look at the full “Sufi” section on Wiki he does get a mention, but seems relatively unimportant amongst all the other Sufi illuminati! His major work of Sufic poetry is called the ”Diwani Hikmet” (= “Divine Wisdom”). The link leads to an English translation. It would seem however, that, just as most pilgrims to Assisi are unlikely to be experts in the Franciscan Rules, the pilgrims to Turkistan (and even many Kazakhs who will never make it there but have adopted him as a figure to revere) will never read the Diwani or consider themselves “Sufis”! Since our own, well educated, guide had not either, he doesn’t even appear to be taught as part of Kazakh literature. So, as of today, you will not see any form of “Sufi” ritual taking place at the shrine – though you will pick up on various mystical and shamanistic practices or at least ones which would not be considered “acceptable” by “purist” Muslims in the West! At the small reconstructed Arystan Bab mausoleum (Yassawi was Arystan Bab’s pupil and, in legend, connects Yassawi to Muhammed via the Prophet’s prayer beads which he passed on) around 6o kms south of Turkistan we had witnessed a rather more “fervent” type of pilgrimage with sheep being sacrificed. This despite the tomb’s “rules”, exhibited in several languages at the entrance - these prohibited “Crying hard, stroking/wiping/walking around kissing and praying, setting fire, tightening fabric around trees, wishing something from spirit, slaughtering at the tomb” (They do allow “thinking about death and the hereafter” however)!!! There is a lot of “religious unorthodoxy” encompassed within those regulations. I suspect that Nazarbayev’s attempts to control religious observance via his semi governmental “Spiritual Association of Muslims of Kazakhstan” (SAMK) is going to have problems exercising control over such matters and that we could yet see a “sheep killing area” reaching the Yassawi mausoleum! Around the Mausoleum itself, but still within the buffer zone, there are a number of buildings which have been reconstructed over original foundations which are worth visiting. The most interesting is the “Underground Mosque” within which is the “cave” (a deep hole) used by Yassawi himself during his later mystic/ascetic period – shades of St Francis again!! The hole of course predated the original mosque but it appears that such semi-underground mosques were common in the area in early Islamic times. Other reconstructed buildings include a Friday mosque, a bath house and several tombs. Interestingly the signs outside of each of them show the UNESCO logo as if they are a part of the inscribed site! I have double checked the Nomination File and they are not. I suppose their authentic foundations could have justified inclusion despite the modern superstructure but, of the 3 criteria on which the Mausoleum was inscribed, I guess only No 3 relating to a “cultural tradition” could have been relevant since they don’t of course possess the architectural OUV for which the mausoleum was primarily inscribed. Nevertheless they form an important part of the “pilgrim route” for locals. Site visited April 2014. The grandiose Timurid era mausoleum of Khoja Ahmed Yasawi is the highlight of Kazakhstan and also one of the highlights in Central Asia. I flew from Almaty to Shymkent which is the usual hub for visiting the town of Turkestan. From my hotel I took a bus to Shymkent central bazaar where I changed to marshrutka. The journey to Turkestan lasted three hours. At Turkestan bus station I took a taxi to the site. It was a sunny and warm spring day and the site was full of local people. The mausoleum is very impressive and you really feel yourself dwarfed by its sheer size. Especially the entrance portal is huge. It is easy to notice that the front facade is unfinished. There are lots of birds nesting in the holes of entrance portal. Backside of the mausoleum and the domes have flawless and brightly colored tiling. The other side of the mausoleum is surrounded by thick walls. Around the mausoleum there is an archaeological site where you can visit several smaller buildings. While the exterior of the mausoleum is detailed and colourful, the interior is very plain, simple and white. There are lots of rooms which contain various valuable objects. Photography is not allowed inside but I remember that it was so packed full of people that I just walked with the flow from room to room. It is interesting that according to this website’s statistics this is one of the least visited World Heritage Sites in Asia. 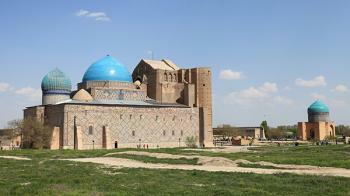 The mausoleum of Khoja Ahmed Yasawi is must see if you are travelling in Southern Kazakhstan. It is also within reach from the capitals of Uzbekistan and Kyrgyzstan. You can compare its grandeur and beauty only to the same era monuments in Samarkand. Anyone who visits the mausloeum fells dwarfed by the magnificence of the building and the atmoshpere of spirituality which pervades the structure. When I visited the site entrance was free.If you are in the city of Turkestan you will not have problem finding the mausoleum ,because all taxi drivers, actually everyone knows where it is.Once you are there, you should defninitely go inside and visit all the chambers including the burial-vault, which is preceded by wonderfully carved doors. Be sure to visit the chamber with a well. Khoja Ahmed Yasawi spent last years of his life in this well, because he didn't want to live longer than the Prophet. Named after individual people: Khodja Ahmed Yasawi is the most prominent religious figure in the history of Sufism.